In this guide I will not teach you how to sell 20 or even 50 more roofs than you already do. In fact, I don’t even know if this will work for you at all. However, what I do know, is that I outsell guys that I work with by about 50% and I usually get more than my guys do. But I’m not bragging – I want to share my experience with you. So what will this be about? Essentially, this is my philosophy and attitude toward roof sales in general. I will share with you what I think make me a better “salesman”. I put salesman in quotation, because I don’t think of myself in that regard. But enough with the introductions – let’s get to the point. Where do you start, if you’ve never sold roofs before? I will be honest with you – I never took any sales (power sales) classes or management skills improvement seminars, or anything of that sort. I actually never even tried to come up with a strategy of how I will sell the roofs. When I started out, I had near zero experience selling anything expensive. It does not mean that I had no experience in sales at all. I did sell cigarettes in front of a train-station in Moscow when I was 12 (rather successfully), and had another less successful enterprise of selling bottled soda when I was 10 or 11. One day, some deaf guy accidentally broke all 6 of my soda bottles, did not pay for them and walked away. I got so discouraged that I quit my soda business all together. Fast-forward 11 years, to when I and my brother started the roofing business. We had no clients / references and had very little equipment. What we did have, was PASSION for what we were doing, a couple of years of installation experience, as well as great motivation to succeed. This passion and motivation was what helped us sell our first jobs, and get the necessary references, job pictures, and most of all experience of talking with the customers. Right off the bet, we decided to specialize in niche roofing products – IB PVC flat membranes and metal roofing. We truly believed (and still do) that both IB and Metal Roofing are the best products that we could provide to our clients. We know both materials well, both from the technical and practical perspectives, nearly every possible application of each, as well as interaction with other products. For example – you cannot combine copper and aluminum, as copper with corrode aluminum. This is a small detail, but when it comes up during a “sale”, YOU (or I) bring it up to the client, explain to them what may/will happen, and they immediately see that you know what you are talking about, and this increases their trust in you. Show the Customer That You Know What You Are Doing and That You Care! You may have the best looking truck or the most professional looking website, but when you talk to a customer one on one, they have to trust you, to give you their business. I will purposely disregard customers who care ONLY about the lowest price. I do not want to work with them, and my prices are too high anyway. 1) Get to know the customer, and find out what they need! Whether a client calls us or emails, I always respond to them (usually by email if possible) with a multitude of questions about their current roof, the condition and source of leaks, and with questions of what they are looking to accomplish in the end. I also ask them to email me pictures and other supporting info, if possible. Based on the information I gather, I suggest a few options that ALL solve the main problem that customer has, as well as try to keep the budget reasonable. If I see a potential issue, I always bring this up to the client – this accomplishes two major things for me: If there will be extra work, the customer knows about it ahead of time, and does not expect you to “just do it” for free. Also, they see that you gave their project some good thought, and looked for the best solution for their needs / problems. Remember: Most homeowners do not care much about technical details, such as thickness, composition of your material, etc – they care about stopping the leaks for a long time, and to make sure that everything will be done correctly (as well as looks). They don’t know how good of a roofer you are, and can only learn it if you inadvertently show them. Saying that you are the “fastest shingler east of the Mississippi” is not the way to win their trust. 2) Do the best job you can do! While it sounds obvious (let’s face it – we all think we are the best roofers), most roofers (and contractors in general) do a mediocre job at best. Seriously! The way I approached this is simple – I never EVER wanted to go back to my jobs to fix leaks. It was absolutely unacceptable. So what did I do? I spent an extra few hours on EACH job, making sure all small details and potential problems would never come up. Think about it. What is a few hours? You miss your baseball game on TV? So what? Going back to your leaking roof takes a WHOLE day, for which you do not get paid, the customer is upset, and you lose the opportunity to ever ask them for a reference. So what do I do? I tell my customers exactly the following (or a variation of it): “I don’t want to come back for a leak repair, so I make sure it (leak) never happens! P.S. – By reasonable price I mean the true cost of your work + materials, so you make profit and don’t have to cut corners, but without inflating the cost. Once again, most people take this the right way, and understand why your price is marginally higher than the other guy’s. End of Part 1 – in Part 2 I will walk you through my typical roof sale, from first contact with the client to the roof estimate, to signing the contract, and doing the work, as well as post-work things. 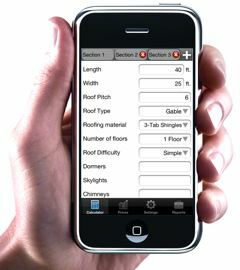 Roof Estimating Software for roofing contractors / estimators / salesmen. Helps you estimate any roof in less than a minute, generates all labor and material prices, as well as material list for the job. You can also send a formal estimate to your client right from the calculator app. Works on iPhone, iPad, and Android phones/tablets. 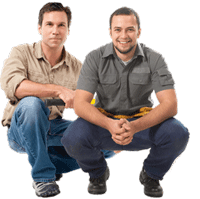 Roofing Business Guide for contractors, and those who are considering starting a roofing biz. Roofing Business Marketing Guide – learn how to get more jobs with advanced marketing techniques developed and tested by real roofers (us). This is such great information. I like the fact that you stress finding out what the customer needs. Customers today are savvy enough to tell if you a up-selling them into something that they don’t need.They search the in ternet and read things just like us.